2015: The Year in Dogfish – Ya Like Dags? 2015 turned out to be a pretty big year for the most under-appreciated sharks in the sea. Now that it’s a new year that promises to offer more cool small shark science, it’s time for a look back at what happened with the spiny and smooth dogfish this past year. When we last left off with spiny dogfish, the U.S. Atlantic commercial fishery had had its Marine Stewardship Council sustainability certification suspended over bycatch issues. By May, the dogfish fishery’s certification was reinstated after the fishery developed a corrective action plan to address problems with bycatch. At no point was the stock status of spiny dogfish in question, the issue was bycatch of declining or sensitive species like Atlantic cod. Spiny dogfish stock status would come back into the conversation near the end of the year when fishery management councils met to determine the quota for 2016-2018. An unexpected drop in spiny dogfish numbers in 2015 and a mechanical problem that caused spiny dogfish to be abnormally undersampled in the 2014 NOAA trawl survey combined to create enough uncertainty in the dogfish stock assessment that the Mid-Atlantic Fishery Management Council recommended a 50 % cut in dogfish quota at their October meeting. However, after receiving many comments requesting an analysis that could estimate dogfish numbers in 2014 and trying some different statistical methods to do just that, the MAFMC determined that a 20 % cut was more appropriate. This may not make much of a difference to the spiny dogfish fishery, which has consistently landed less than 50 % of their quota anyway. The smooth dogfish may have had a bigger year than the spiny. Image by Andy Murch (elasmodiver.com). After years of high landings and no rules, the smooth dogfish saw a lot of fishery management action in 2015. 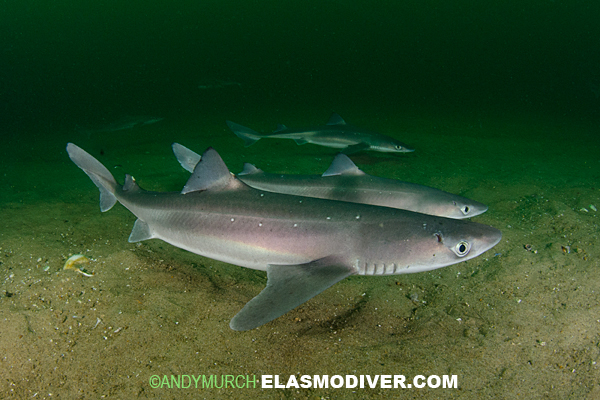 In late June NMFS released the first ever stock assessment for smoothhound sharks (the group that includes the smooth dogfish, Florida smoothhound, and Gulf smoothhound) in U.S. Atlantic and Gulf of Mexico waters. This assessment determined that despite experiencing the second highest fishing pressure of any shark in U.S. waters (second only to the spiny dogfish), smooth dogfish are doing okay, with populations not overfished and fishing rates not likely to overfish the species. Stock assessments are the first step to developing a fishery management plan, and as of March 2016 smooth dogfish will have one, after the passage of Amendment 9 to the Consolidated Highly Migratory Species Fishery Management Plan. With rules in place before overfishing has occurred, smooth dogfish stand a good chance of avoiding the kind of population declines that have afflicted other sharks. Interestingly, the way spiny and smooth dogfish federal fishery regulations are made is very different. This is because smooth dogfish are classified as a highly migratory species while spiny dogfish, which are also very highly migratory, are not. What this means is that federal regulations for smooth dogfish are drafted directly by the NMFS Highly Migratory Species Management Division while spiny dogfish regulations are generated by the New England and Mid-Atlantic Fishery Management Councils. The regional councils are made up of representatives from NMFS, commercial and recreational fisheries, environmental non-profits, and other stakeholders, though ultimate approval for those regulations is up to NMFS. 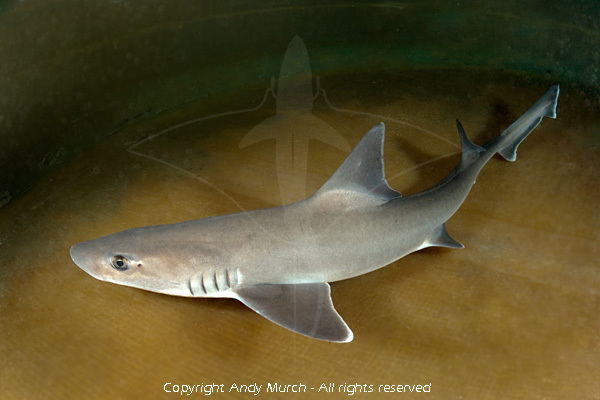 Therefore groups other than NMFS can have a bit more influence over spiny dogfish regulations than would be the case for centrally-managed highly migratory species like the other coastal sharks (and smooth dogfish) (stakeholder groups can still make public comments and serve on advisory panels). Of course this is all for federal waters greater than 3 miles from shore, anything closer inshore is considered state waters and is jointly managed on the Atlantic coast by the Atlantic States Marine Fisheries Commission. It can be tough to keep up with but it will be interesting to see how management decisions affecting smooth and spiny dogfish differ going forward. Edit 01/08/16 – The last paragraph was expanded to more accurately describe the differences in regulatory bodies for spiny and smooth dogfish. The previous version was over-simplified to the point of being inaccurate. Thanks to Sonja, who goes to far more of these meetings than I do, for pointing that out. This is what I get for trying to get a post up last-minute before getting out on the water. Pingback: Dogfish Days at the ASMFC | Ya Like Dags?